Pictures taken during the Blood Patch, for CSF leak. During the Blood Patch Stuart asked if he could take some pictures. They said it would be no problem as long as he didn’t show anyone but me, and as long as the screen showing my name wasn’t in any of the pictures. 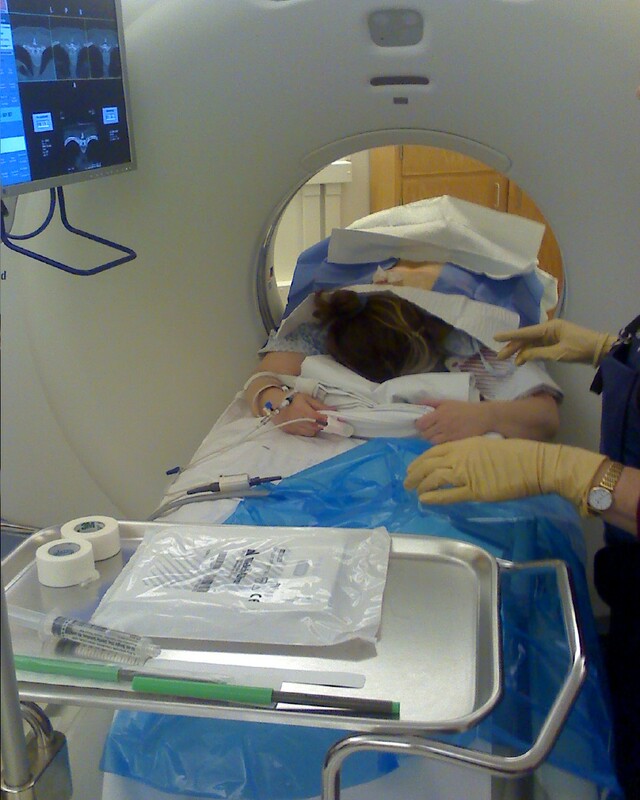 In this photo you can see me in the CT Scan, they are lining up the next leak to patch. You can see the screen on the left hand side that shows the pictures from the CT scan. 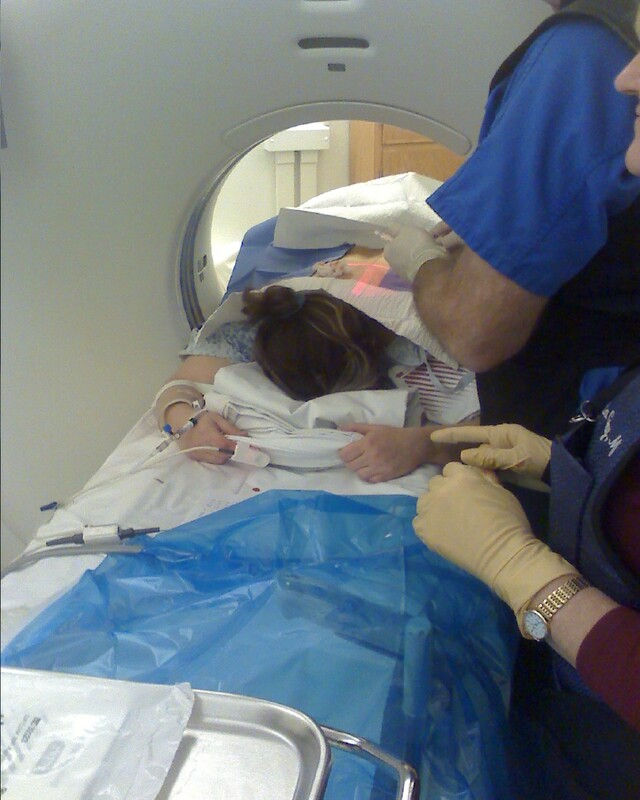 This photo shows how the CT scan has a laser light that shows them exactly where to put in the needle. 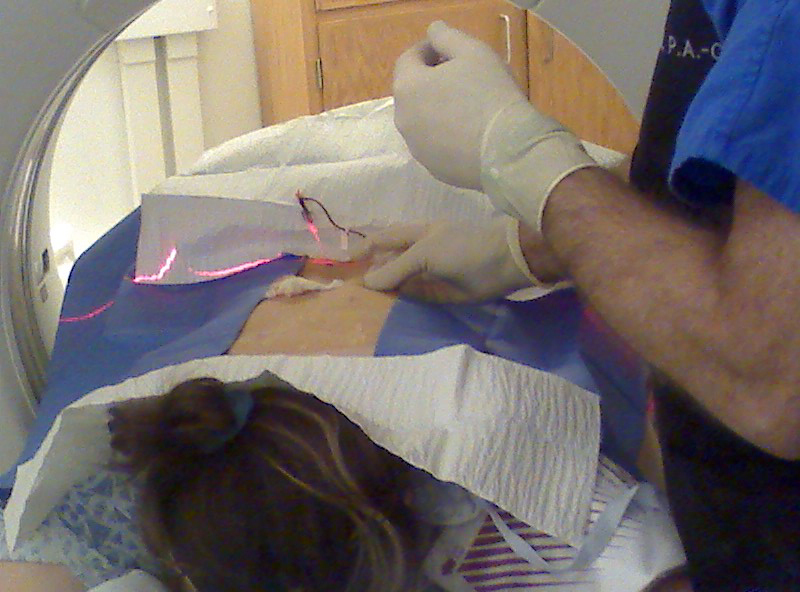 Here’s a better view of the laser light, it’s even shining off of the needle they have placed in my back. 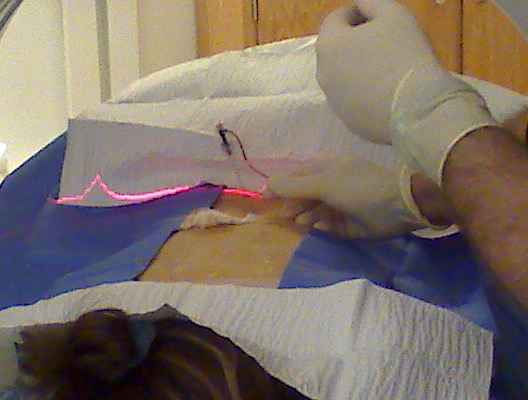 Here you can see the blood being put in. This photo is very similar to the previous one, but you can see the needle in this one, and see just how very thin it is. Thank you to everyone who sent me good wishes for going though this procedure. I’m happy to say that I do think it has done some good. I’ve been able to close my eyes and shake my head without getting dizzy….That was amazing. This evening, I’m feeling a little off, but I over did it today. I was supposed to do very little to nothing for 3 days. Today, I went with my husband up to a little mall near here…NO we did not go Christmas Shopping. He needed to look for something at the computer store, then we decided to get some lunch. Well, I did run in one store and buy a Christmas present, but I had a coupon, and it didn’t take long. Still no headaches, no real dizziness (I don’t think I’d really count the fact that I feel a little off this evening, I think I just wore myself out.) I’m hearing better out of my left ear. I still can’t hear from my right ear, I still have tinnitus, and I still have that full feeling (mostly in the right ear). Right now, I’m feeling good about things. The Spinal Fluid Leaks are patched…. so glad to hear things are going well!! i consider it wonderful news! be sure and take it easy, although i guess the three days have passed by now, ;). i’m still cheering you on and hoping each day brings even more progress for you. thanks so much for taking the time to keep us all posted. it’s so considerate of you to think of us during all of this now go take care of you! Very Cool pictures Wendy. Neat to see what’s going on. Glad your feeling better!! I can’t wait til I get to talk on the phone with you again!! 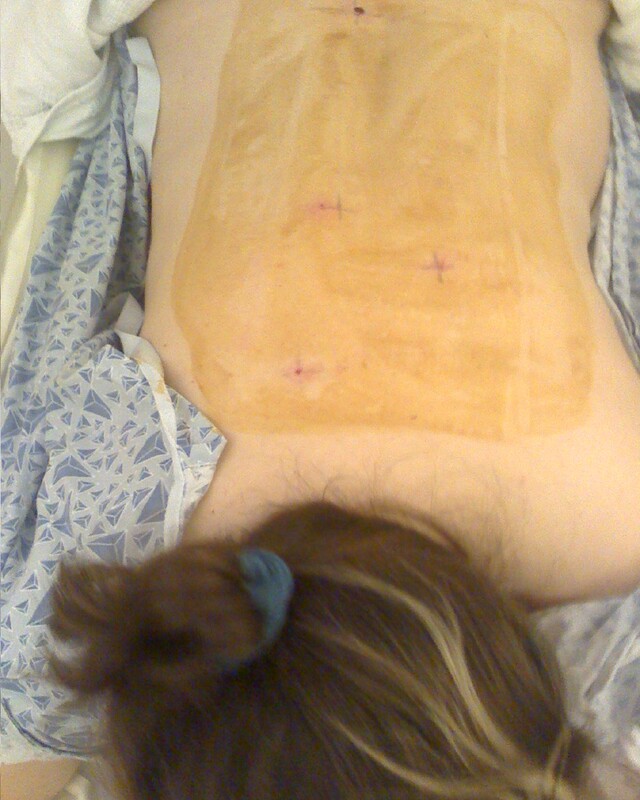 *smiles* So exciting to not have the vertigo and headaches! WOW!! I thought all the leaks were along the spine,the mark on the right of the photo is far away from it.Was a leak patched here as well? 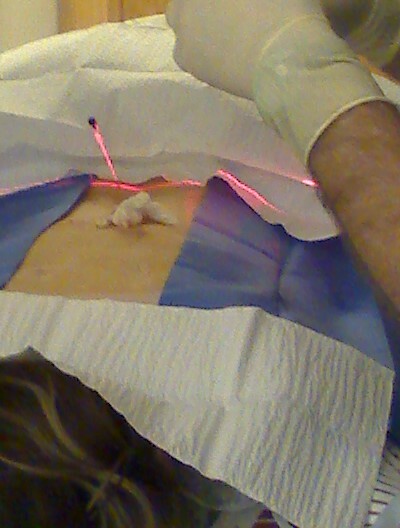 Thanks so much for posting about this procedure! Sorry, but I can’t answer that. All the marks show where they inserted needles, however, I don’t know how far the needle went in or in what direction. I never asked Dr. Gray about that. Perhaps I will next time I talk to her. If you have more questions please feel free. I may not have the answers, but I can try to find out. I did not have an orange liquid come from my nose. CSF is clear…but I didn’t have it leak from my nose. I did feel much better for a while…4 months were bliss….but unfortunately for me, it didn’t last. I ended up having high pressure and kept “blowing out” and causing moments of low pressure….that’s when I had bad symptoms and they checked it and I was low with leaks. I’m on a medication for the high pressure now. Unfortunately, this procedure didn’t help many of my symptoms. They lessened them (I was having symptoms like I had a brain tumor) But the Meniere’s is still there, I lost my hearing in my left ear, and am almost deaf in my right. I got a cochlear implant in July…it is a wonder. I’m still having migraines, and I have vertigo with them. I will be getting Botox on Oct. 3rd to hopefully help. I hope that answered your questions. Sorry I don’t have better news about it working for me….but I do know that I was only one of 2 in the study that got no relief from their Meniere’s with this. iman, I’m sorry but I don’t know anyone else with CSF leaks. From what I understand it normally works….sometimes they have to do it more than once, they may miss one, or didn’t old. Every procedure is out patient. It’s done under a local. I was never put under. I had a very good and respected doctor at Duke, and trust her very much. The reason it didn’t work for me is because my leaks were being caused because I have high CSF and kept blowing out…causing leaks. Now that the high CSF is under control, the symptoms from that are under control. This is not the only issue I deal with, so there are a lot of other factors involved with me. iman, Well, everyone is born with CSF. : ) They don’t know what caused mine to change to an abnormal level. I don’t know about exercises or food to improve an abnormal CSF condition. But I’m not a professional or anything, I can only tell you what happened to me. I do have a lot of things going on, but I’m happy with my life even with the limitations. Of course, some days are better than others, but it was that way before I got sick. : ) I don’t think about “what if” nor do I mourn my previous life. I make the most of what I have…as often as I can. I have a loving husband that helps me a lot….not only physically but mentally as well. I’ve met many loving people since this started, and I’ve learned a lot about myself. I think I like myself more now than I used to. So all in all, yes I have a long list of chronic illnesses, but they don’t define who I am. I hope you find help. Finding the best doctors and being your own best advocate is essential.